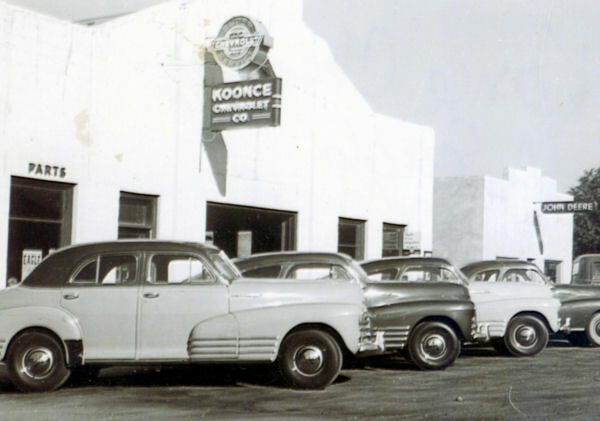 There was a time when there were several car dealerships in town, the most prominent of which was the Koonce Chevrolet Company in downtown Eagle. Arthur Bushnell (A.B.) Koonce arrived in Eagle in 1901, at the age of 21. He was an ambitious young man willing to work a variety of jobs. These included working for a sawmill, the railroad, ranching and operation of a garage and salesman of Willys-Overland cars. For a time, Koonce worked as a commission agent for cash crops. He had a fascination with steam engines and a knack for business. 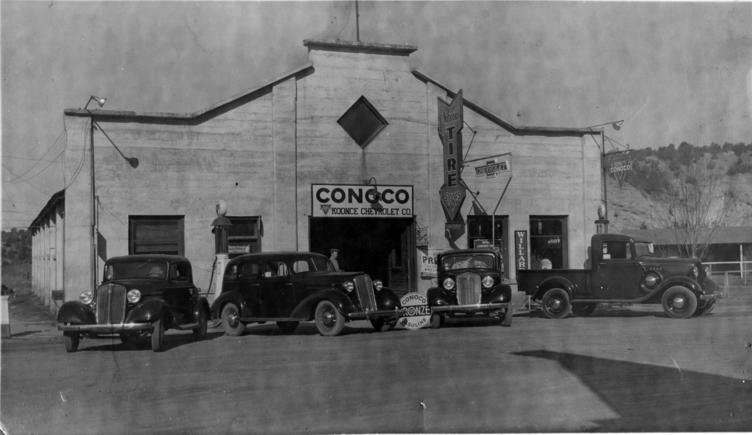 In 1926, Koonce built this all-concrete garage building, which evolved into a Chevrolet dealership that operated for 30 years. In 1938, Koonce added a modern service station on the west side of the garage which sold Phillips 66 products. The service station faced Grand Avenue, now also Highway 6. A.B. Koonce raised his family in Eagle and was a civic leader, serving as mayor and leader of the Eagle Commercial Club (the forerunner of the Chamber of Commerce). By the 1960s, bigger-city dealerships began dominating the automobile business. After A.B. Koonce died of a heart attack in 1963, the dealership was shut down. The building was sold to the Eagle County School District for administrative offices. In the mid-1970s, the building became home to the county’s first institution of higher learning, Colorado Mountain College housing both administrative offices and classroom space. In recent years, the building has been used by the Eagle County School District for Red Canyon High School classes, an alternative high school.